Rather in the manner of the aforementioned mollusk, I have been wheeling my particular fraction of a home behind me while making my way through the quiet, primarily residential district in Islington where Suh’s studio is located. There are pockets of wildlife alongside the canal running through the development, and a few swans can be spotted coasting on the water. To call the place quaint would be stretching it though; at most, it is a temporary retreat from the bustle of city life that beckons just a few streets away. As far as artists’ studios go, Suh’s is almost fastidious in its sense of order, or at least tempered chaos. Architectural models and a curious series of uncompleted miniatures of humanoid machines rest upon matte-white tables, well served by a row of identical arching work lamps. The miniatures are made from kits designed by the Japanese artist Kow Yokoyama, of whom Suh is a fan. The completed versions are displayed proudly on the shelves above. On another table, a row of drawing implements, poised to resume their duties, lies side by side next to an unfinished piece. The atmosphere is not so much clinical as comfortably sedate, evoking a subtle sense of ergonomic bliss. This is not really a studio, but an office, or so said the almost cautionary note that Suh sent via email prior to our meeting—a point he reinforces as we sit to talk. This little act of pedantry perhaps betrays a certain ideal he holds as to what counts as a proper studio. It seems that, for Suh, studios are places of intense, hands-on production, whereas the nature of his practice these days leaves him increasingly little opportunity for such pursuits. Working in the medium of large-scale sculptural installation means that most of the day is spent on administrative tasks and transcontinental Skype conferences with curators, fabricators and other collaborators—a process he describes as exhausting. Artists today are more like managers, he quips, though not without slight ambivalence. In fact, one cannot help but detect a dash of romantic yearning in his voice for more time to make smaller, more intimate works. He speaks especially fondly of his residency at the Singapore Tyler Print Institute in 2010, during which he made a series of thread drawings, drafts of which can be seen in his office/studio. In this sense, Suh’s little foray into model-making, which he calls “a hobby, but not really,” can be seen as another outlet for his tactile cravings. Possibly, it also reveals a desire for a level of groundedness, whether this is linked to the space of his studio or to the larger urban locale. 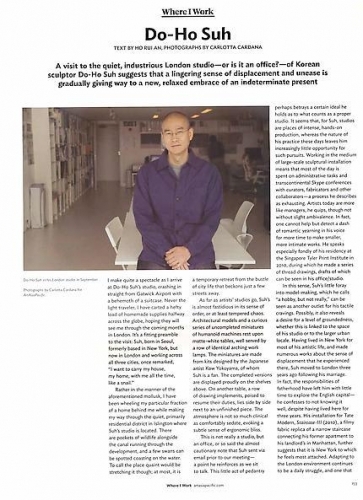 Having lived in New York for most of his artistic life, and made numerous works about the sense of displacement that he experienced there, Suh moved to London three years ago following his marriage. In fact, the responsibilities of fatherhood have left him with little time to explore the English capital—he confesses to not knowing it well, despite having lived here for three years. His installation for Tate Modern, Staircase-III (2010), a filmy fabric replica of a narrow staircase connecting his former apartment to his landlord’s in Manhattan, further suggests that it is New York to which he feels most attached. Adapting to the London environment continues to be a daily struggle, and one that is increasingly difficult, yet also increasingly necessary, as age encroaches and his children grow up. Perhaps it is more accurate to say that Suh oscillates between a desire for groundedness and a tendency toward flight, in which case the staircase becomes a compelling metaphor. He identifies with the figure of the nomad, but clarifies that the nomad is not simply someone who moves from one city to another, but one who resides in the space between each city, who is always hovering, always in transit. He further stresses that his multiple relocations were due less to career motivations than to personal circumstances. He simply followed where his life led him—a life not of displacement but as displacement. His iconic Seoul Home/L.A. Home/New York Home/Baltimore Home/London Home/Seattle Home/L.A. Home (1999)—a silk facsimile of his family’s traditional house in Korea that moves with him to whichever city he is going to live—best expresses this condition, being a work that is, in Suh’s words, “site-specific yet movable.” As if passing through a series of skin contacts, the work gathers new impressions as it circulates through different localities: its specificity lies precisely in the impossibility of fixity. But for Suh, displacement is not something that necessarily needs to occur across geographical contexts. He says that, although some might consider the displacement he speaks of to have begun with his arrival in New York in the early 1990s, the process was already underway during his childhood in Korea. Suh grew up in a time of unprecedented economic expansion, when everything was directed toward modernization, often in emulation of dominant capitalist models. The West’s values and expressions entered the country along with its consumer products. Within this prevailing climate, Suh’s family was a bit of an anomaly, for his parents were, by and large, traditionalists who believed in the importance of looking back at one’s roots in times of rapid change. In such an environment, Suh could already feel the schism that had opened between the world represented by the traditional Korean house in which his family dwelled and broader Korean society, enthralled by the promises of capital. He was, in effect, displaced within his own country.